The Bistro Bar is Portable Keg Cooler Beer Dispensing System used for Hospitality, Breweries, Tailgating, Concert Venues. Bistro Bar is a mobile beer tap that can go anywhere. 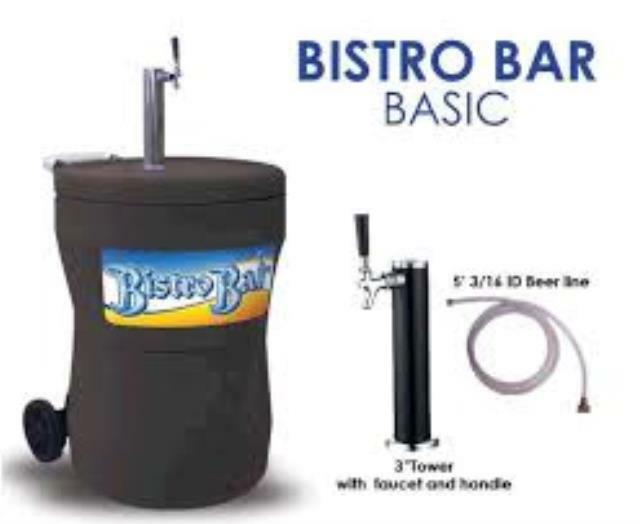 Bistro Bar, is the coolest way to pour a perfect draft beer anywhere the road may take you. Nothing tastes better than a draft beer so why not take it with you! Mobility Unlike jockey boxes, Bistro Bar may transport kegs of all sizes. Durability Use high density polyethylene to support weights up to 200 lbs. Ease of load Reduce height of load to 17 inches. Easy Setup Setup time within 10 minutes. Storage Collapse unit to only 27 inches and allows stacking up to 9 feet reducing storage space and fits into compact cars such as a Toyota Corolla. Temperature Reduce amount of ice used and maintain temperature of keg to 36-40 degrees F.
How to get beer out? Utilize our Ubertap foot pump to conveniently begin dispensing beer just like you would with the traditional hand pumps. Aesthetics Good looks to display at graduations or corporate events. * Please call us with any questions about our keg tap bistro bar rentals in Stillwater MN, and surrounding cities in Southeastern Minnesota and Southwestern Wisconsin.